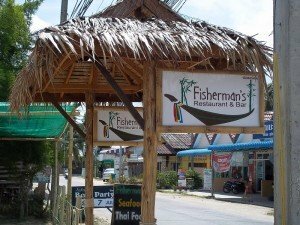 This place is coming up to 10 years old and it is rated by many as the best restaurant on Koh Phangan. 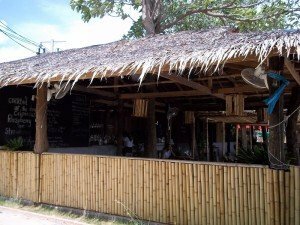 I partly agree with this – it is the best restaurant of its kind in Koh Phangan. What they focus on is Thai seafood dishes with a Western twist and made a bit elaborate, along with some inventive cocktails. It is good for sure and few people come away disappointed. The Fisherman’s Restaurant and Bar is located on the Baan Tai Road, about half way between Haad Rin and Thong Sala. The restaurant is in a wooden house with a coconut leaf roof on the beach. Good location to eat seafood! It looks best at night as they have attractive lighting and you see the lights on the beach across the sea on Koh Samui. Plenty of seating inside and if you fancy they have a few boats you can sit inside, with a table built in, if that is not your thing then they also have normal tables and chairs. The best dishes here are the Yellow Crab curry, their own special ‘catch of the day’ fish and chips, and whole fish hard fried or grilled with sauce. They have other dishes, including Western ones, which don’t involve fish and which aren’t bad but not nearly as good as the fish dishes. It would be a bit odd anyway to come to a fish restaurant and not eat fish, but each to their own. The Fisherman’s Restaurant and Bar is about medium priced, dinner for two with drinks will set you back around 1,200 THB, which is not that expensive for what you get. Also try the cocktails, from 19.00 to 21.00 is happy hour.